Squaring is simply multiplying a number by itself. To find the square of a two-digit number ending in 5, multiply the tens digit “By one more than the one before” or by the next number. Then suffix the product of 5 x 5, or 25.
a. To get the first part, multiply the tens digit, 6, by the next higher number, which is 7.
b. The second part is always 25. This also works for large numbers. a. To get the first part, multiply the tens digit, 99, by the next higher number, which is 100. Wasn’t that fun, fast, and easy? Vedic Math gives us alternative ways of solving problems. And while special methods like this can be used only under certain conditions, they can be fun (and magical!) when you spot a problem where you can use them. 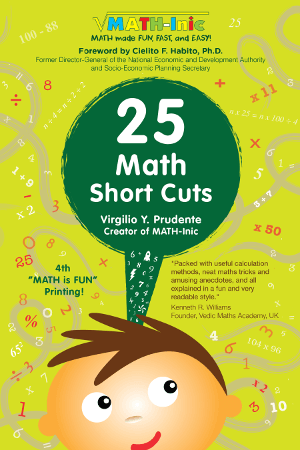 For more Math shortcuts and to see the proof for this shortcut, see Chapter 15 of the 25 Math Short Cuts book. Sign up and we will email you blog updates, shortcuts from our bestselling book, MATH-Inic news, promos and more.